Ok folks. Lets look at the history repair data to gain an overview on what happenend. This is the first time I see the data myself in such a comprehensive format. When looking at my repair table, I could not see this as clear as I see it here since there were all repairs listed. Apr-2015 Changed rear axle drive oil. 132000 6900 Mai 16 Rear wheel drive bearing changed. 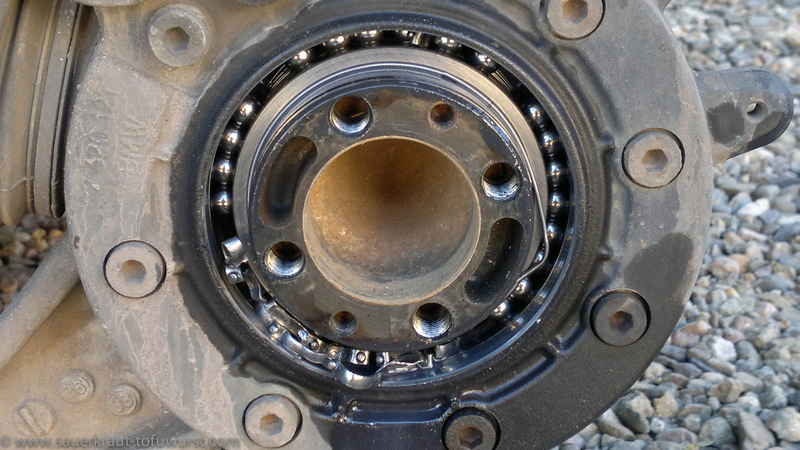 Some noises remain, so most likely one or both of the other bearings is also broken. 137500 5500 Jul 16 All 3 bearings in rear wheel drive changed. In the beginning the sidecar was fully loaded. We rode through the curvy Alpes, the bad roads in Africa as well as the curvy roads in the US. All the adventure fun trips e.g. Death Valley, Cinnamon Pass were done with an almost empty sidecar (low load). 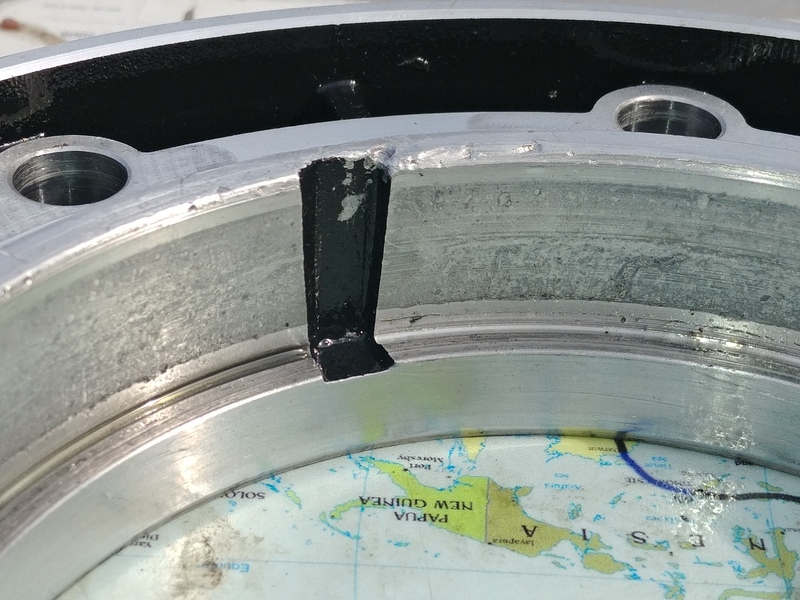 In Mexico, I change the bearing for the first time with improvised tools and methods. I did change the rear wheel drive oil after about 1000km at the first change. The shimming was checked and adjusted when all bearings were changed (Jul2016). The bike was never as fully loaded as during the RTW trip. Furthermore I was only riding in Finland (there are no real curves in Finland like in Alpes, Rockies or Andes). At our trip to Russia, the sidecar had a bit more load again and in the beginning the roads in Karelia felt a bit more curvy. After I changed the bearing the last time with the used bearing, I drove only very straight roads back home so the stress on the system was likely very small. However when looking at the facts it becomes obvious that something was wrong in paradise for a long time. My dear friend and supporter Guy suggested that the housing cover (BMW 3311233003) has widened and does not give enough support for the bearing anymore thus the big ball bearing gets eaten. It seems that housing cover already got damaged in the first break down and ever since it had eaten the bearing. The only conclusion I can take here is that when changing the big ball bearing on a sidecar it is better to also change the housing cover as well. The sideforces on a sidecar are enourmous especially with load in combination with curvy roads. Well, long time no speak, I was nearly dead (no joke) lost one eye, but here I am... I never trusted the R1150GS sidecar and I sold it. The buyer did now 25K on it and did not got a problem, he does mainly autobahn and frequent drives Belgium to Austria, but with 3 people and heavy loaden. Brilliant information. People need to do research for buying the cars. It is important to go into a dealership knowing a few pieces of extremely important information by the Mercedes Exporter UK. Thanks for sharing this info! Did you know you can check history of the car, odometer readings, total loss records, accidents history, mileage rollback, recalls, defects and other stuff before purchasing a car? A friend of mine recommended me https://www.faxvin.com/recalls/truck. That’s how I’ve chosen a safe car for trips with my family. Strongly recommend!